This gift card can be used online and over the phone. 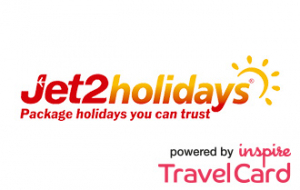 Jet2holidays powered by the Inspire Travelcard allows us to create packages and city breaks around the world to suit any traveller. Ranging from two to five star hotels, Jet2 working with Inspire can offer fantastic value on hotels, flights and baggage allowances. The Inspire TravelCard is a prepaid gift card that can be redeemed on www.travelbynspire.co.uk. With this card you’ll have complete access to the great range of travel products available form Travel by Inspire including Jet2holidays packages. If you are booking via our call centre please tell the Travel Agent the Card Number and PIN and the value will be subtracted from the booking total.